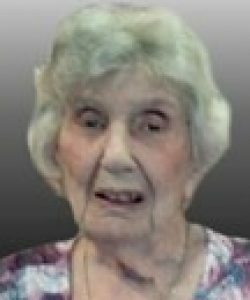 Gloria L. (Forbes) Bell, 101, passed away peacefully at Shrewsbury Nursing Home on Friday, December 21, 2018 after an illness. She was born in Worcester, the daughter of C. Russell and Frances A. (Chapin) Forbes and had lived most of her life in Holden before moving to Colony 3 in Worcester. Her husband of 55 years, Wesley O. Bell, passed away in 1995. She is survived by three sons, Bruce Bell and his husband, George Smart of Quincy, Alan Bell and his wife, Marilyn of Rutland and Craig Bell and his wife, Theresa of Holden; three grandchildren, Cindy, Melissa and Jackie; four great grandchildren, Alexis, Jason, Desiree and Jocelyn; and many nieces and nephews. Gloria worked in the cafeteria for the Wachusett Regional School District for many years retiring in 1974, and was a former member of Chaffin Congregational Church in Holden. A celebration of life for Gloria will be held on Saturday, December 29th at 11 a.m. in the Miles Funeral Home, 1158 Main Street, Holden. A private committal service will be held at Worcester County Memorial Park at a later date. In lieu of flowers, memorial contributions may be made to Little Brothers Friends of the Elderly, 3305 Washington St., Jamaica Plain, MA 02130, American Cancer Society , 30 Speen St., Framingham, MA 01701, or GLBTQ Legal Advocates & Defenders, 18 Tremont St., Suite 950, Boston, MA 02108.